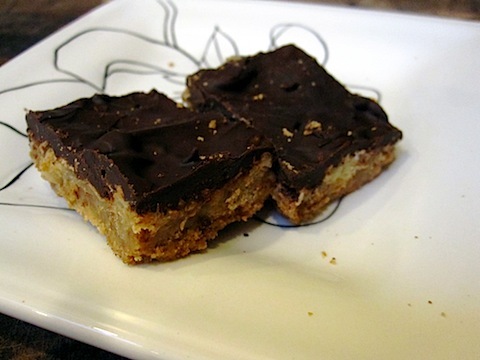 pint-sized mama: Homemade "Mounds Bars"
Good morning on this lovely Good Friday! What a beautiful day to celebrate Jesus' sacrifice for us! The other day I opened my pantry to grab a graham cracker for a quick snack (I know, I am 4 years old.) I opened the (unopened) box and quickly observed that all 3 packages were full of broken graham crackers. When I whined to my husband about my graham crackers being crushed, he gave me a sheepish grin and admitted that he just may have dropped the box. 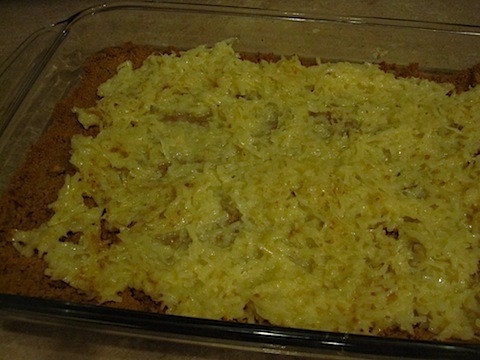 Instead of being irritated, I decided to make use of the crushed graham crackers and bake something with them. 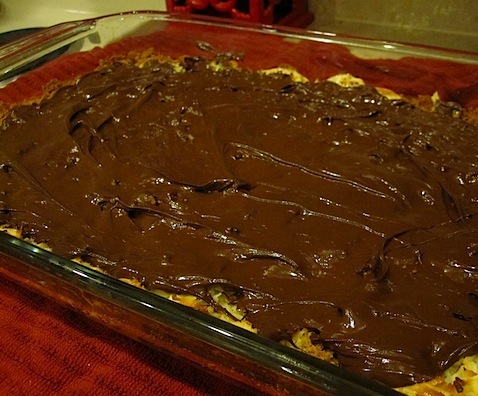 3 days and a lot of calories later, here is a really addicting and yummy recipe for Homemade "Mounds Bars" that I got from All Recipes. 2. 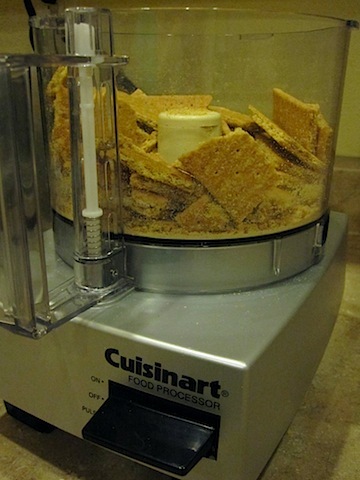 Crush the graham crackers into fine crumbs. It took me about 8 pulses in a food processor followed by about 20 seconds of processing. You could also put them in a gallon sized ziploc bag and have at it with a rolling pin. You will use 2 cups of the crumbs. 3. 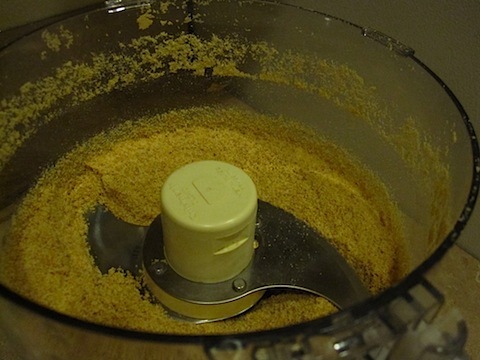 Combine the graham cracker crumbs, sugar, and melted butter. Mix and pat into the bottom of one 9x13 inch baking pan. (Do not pre-grease the pan.) Bake at 350 for 15 minutes. You want the crust to set. 4. 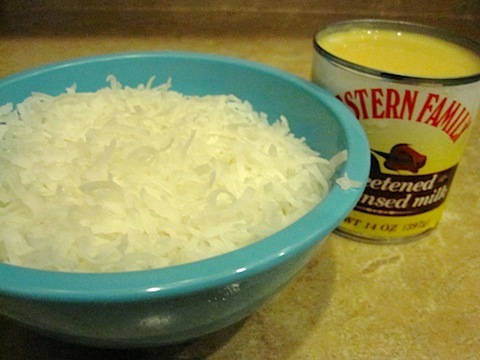 Combine the flaked coconut and sweetened condensed milk. 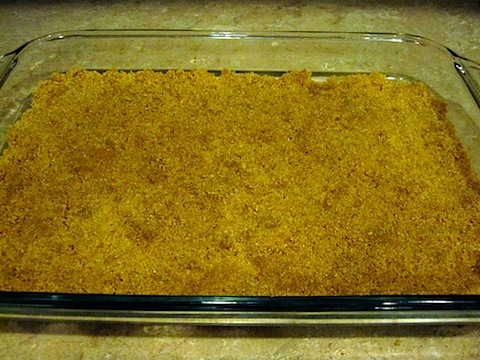 Spread as evenly as you can over the graham cracker crust and bake at 350 for 15 minutes. 5. Spread the melted chocolate chips over the top of the coconut. Let cool and then cut into squares. (I melted the chocolate chips in the microwave while the coconut was baking in the oven. I put the chocolate chips into a microwave safe bowl and heated for 20 seconds, then 15 second intervals until they were melted. Be careful to not heat longer than 20 seconds in the microwave or your chocolate will burn. Stir often. These look divine! Connected with you through Braxton Life "Follow along Friday." You are so super cute and so is your baby :) Looking forward to reading more! Hi Devon, thanks for your comment! 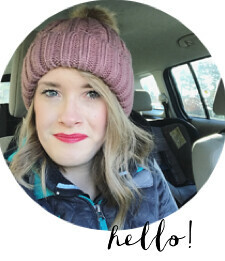 I loved the Follow Along Friday, it's nice to meet people through that! Thanks for your encouraging words and your readership! Have a great day!